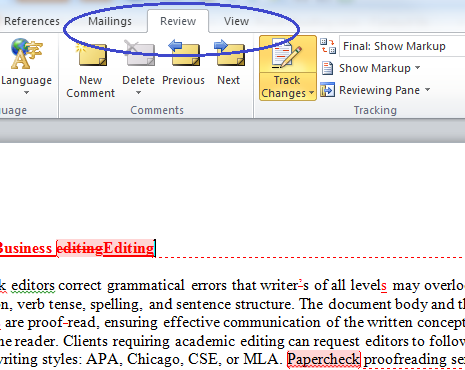 Open your document in Microsoft 2010 and click on the Review tab. Notice that the Track Changes icon is illuminated. 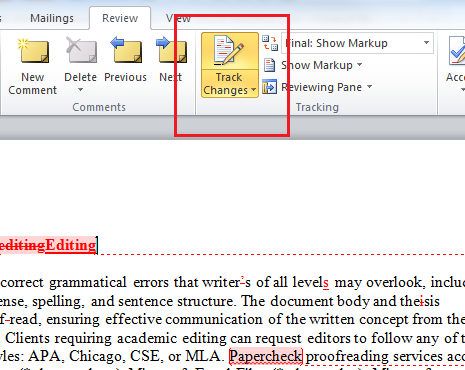 If Track Changes is illuminated in your document, you will need to disable the Track Changes feature before you continue. To disable this feature, simply click on the Track Changes icon. Notice that the Track Changes icon is no longer highlighted. 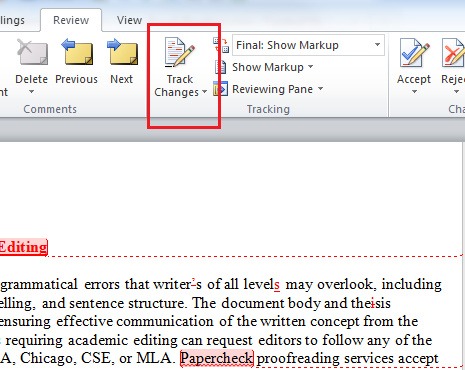 Place your cursor at the beginning of the document and click the Next button. This will bring you to the first proposed correction. 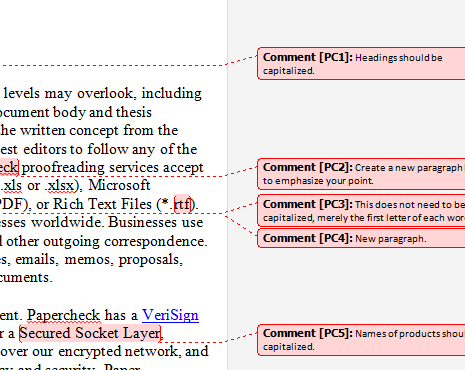 Notice that the first proposed correction is highlighted. 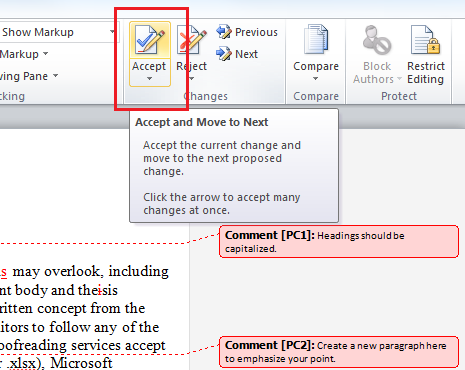 Click the Accept icon to accept the change proposed by the editor. 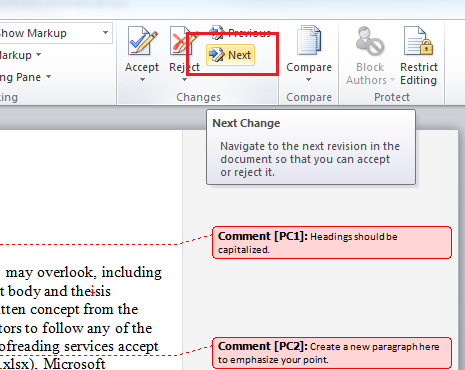 The cursor will automatically advance to the next proposed change. If you wish to reject the change, simply click the Reject icon to the right. 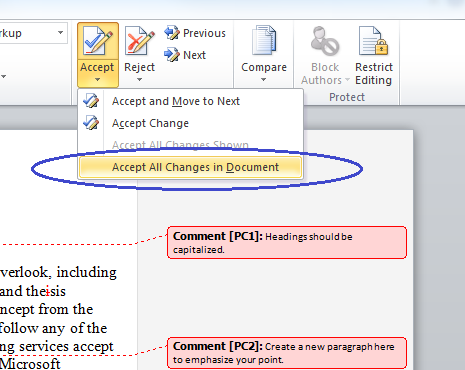 To accept all of the changes at once, without reviewing each proposed change, click the drop-down arrow on the Accept icon, and select Accept All Changes in Document. Notice that all of the proposed changes have been incorporated into the document. You will need to address the editor comments separately. 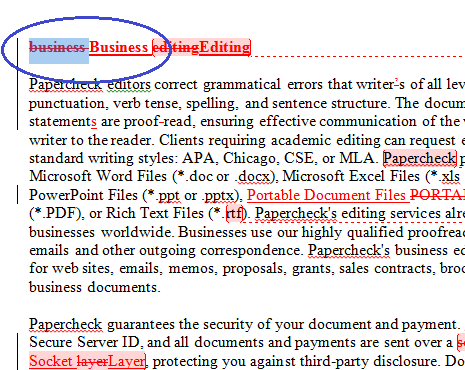 For instructions on removing editor comments, please go to: 2010 Microsoft Word Remove Editor Comments.